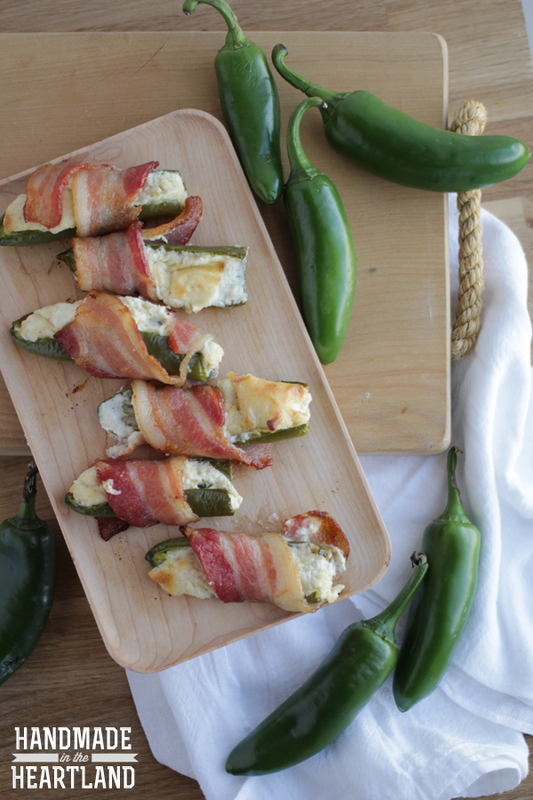 Bacon wrapped jalapeños are an easy and delicious appetizer perfect for parties! Trust me, they will disappear before your eyes! This post contains affiliate links. So I’m kind of a wimp when it comes to spicy food and I thought I would totally hate these bacon wrapped jalapeños. My friend Lindsay brought them to a party and I tried one. I was super surprised to find that I love them, like love them so much I could eat a whole plate all by myself. The cream cheese and bacon tame these treats so that there is only a hint of heat, which makes them totally irresistible. Watch the video below to see how easy they are to make! I always bake these on my Silpat. It’s an amazing non-stick baking liner and you can read the top 3 reasons I love my Silpat, It’s amazing! If you make these please let me know! It thrills me to hear from you and see what you’ve made! Leave a comment or tag me on Instagram (@handmadeintheheartland) or facebook! 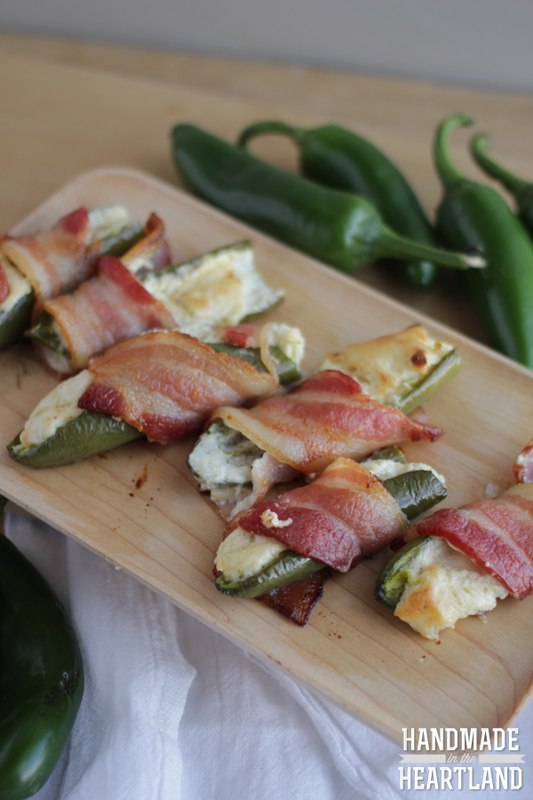 This is one of my favorite appetizer recipes! It’s so great for parties and my husband likes it as much as I do! 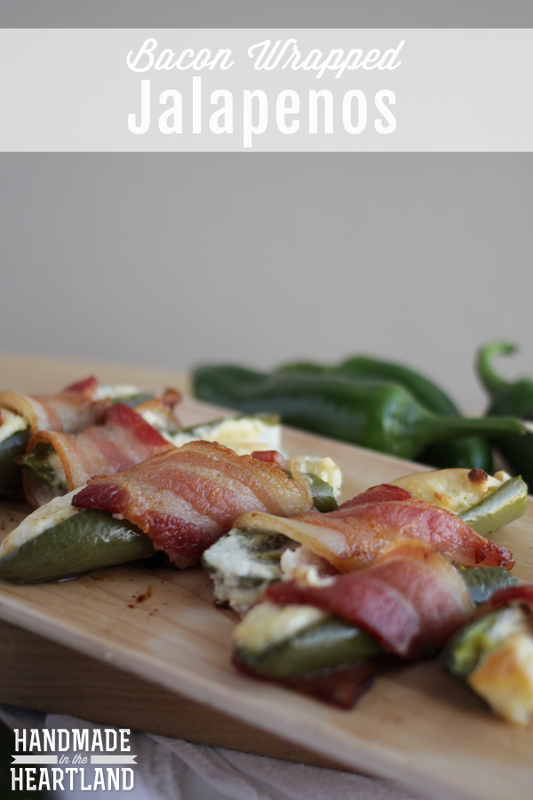 Bacon wrapped jalapeños are an easy and delicious appetizer perfect for parties! Preheat the oven to 375. Mix the spices into your cream cheese, I like to mix mine with my kitchenaid mixer because it makes it nice and smooth. Cut your jalapeños in half and remove the seeds. Cut the slices of bacon in half. 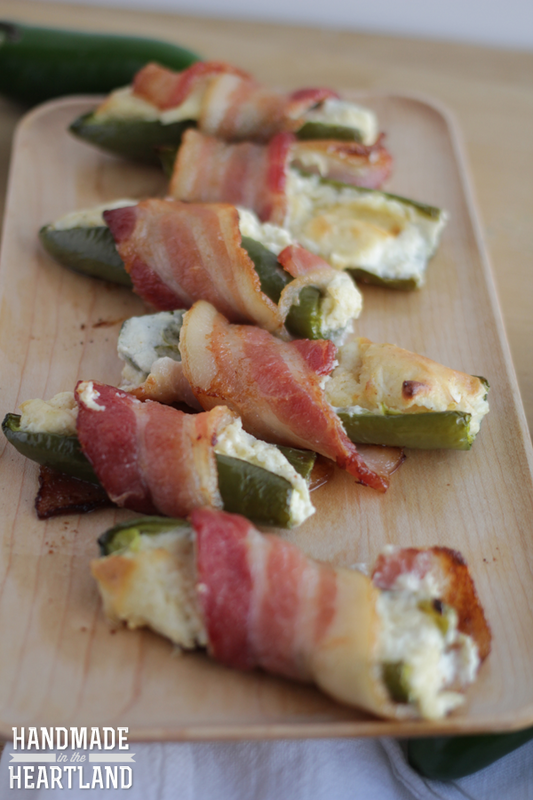 Fill each pepper half with cream cheese mixture and then wrap the bacon around. You can secure the bacon with a toothpick, however the bacon usually does stay without it. Bake for 30 minutes or until the bacon is crispy in spots. Let cool for a few minutes and then serve warm. Enjoy!